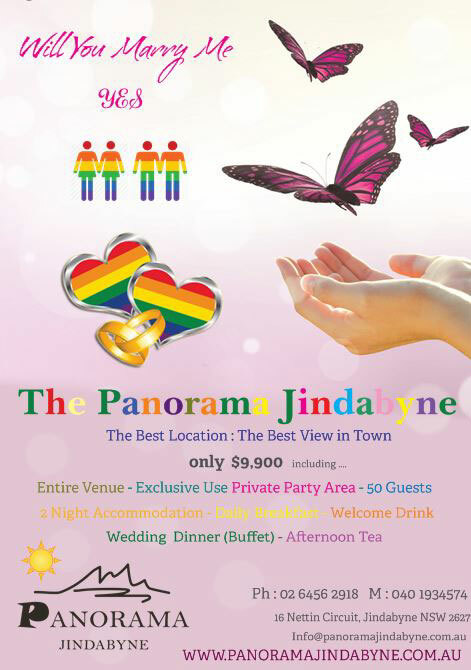 The Panorama Jindabyne is the perfect location for your wedding. Located just 2 hours from Canberra and half way between Sydney and Melbourne, it makes it easy to accommodate people from all over the country. Your ceremony and reception can be held on the premises with stunning Lake Jindabyne as a backdrop. But it’s not just the stunning location that makes a wedding special at Panorama Jindabyne. A feature of our venue is our special designed buffet, where your guests can choose what the like, from a wide range of quality healthy meals including gluten free & vegetarian options. A buffet means your guest will be able to relax and have the freedom to choose a meal that they like and it also helps keeps the cost down, so you can save money for other more important things, like your future. What makes your wedding so special at Panorama ? We can help plan your entire wedding to make it memorable. From the menu, to the flowers and table settings, we will work with you to create the perfect day, and then when it is all over, you can just retire to the Honeymoon suite. Your guests can enjoy the day too, without the worry about driving. Contact us today for more information or to book a date for your special event.